Welcome to my Digital Diary. This reminded me of the report on “Digital Identity,” where Elahi performed Tracking Transcience 2.0. He brings a point where we have become a global society of surveillance. Giving excess information to everyone and sharing everything which devalues private information. This links to the study of social broadcasting as we can see how far the internet has evolved. The way society has manipulated and used it to their own benefits and rights. Despite the increase of freedom the public has, it will still be forever monitored by someone even though it is more decentralised. 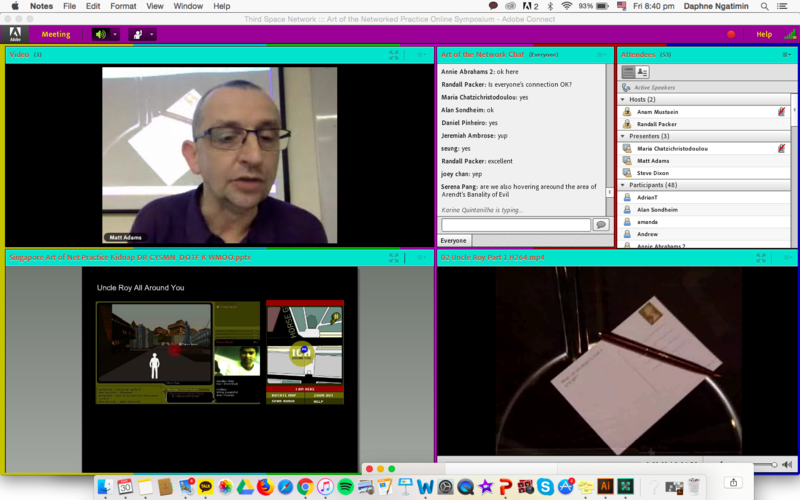 This ties in to the exploration of social broadcasting as an unfinished communication revolution through the Art of the Networked Practice Online Symposium. It unites local and global speakers and audiences into the third space through adobe connect. This brings an active international telematic arts community that rises above the geographical distances to Singapore. 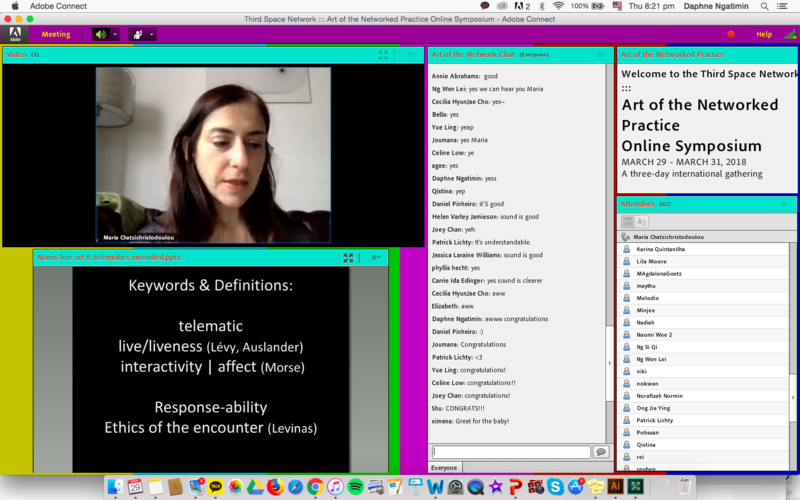 The symposium highlights how networked space can be used as a platform for live performances and online artistic works; stimulating dialogue, and encourages an online global open discussion through the chat room. On the first day of the symposium (29th May), it highlighted the idea of being connected in telematic space by embracing the new internet work based on online social play. Maria Chatzichristodoulou (also known as MariaX) presented on “The Promise of Internationalism”. During Chatzichristodoulou’s keynote, she mentioned the ideation of FLUX. Flux is defined as a movement of continuous changes, constantly changing. She referred this idea back to the actions and happenings in the culture of art, specifically telematic art. 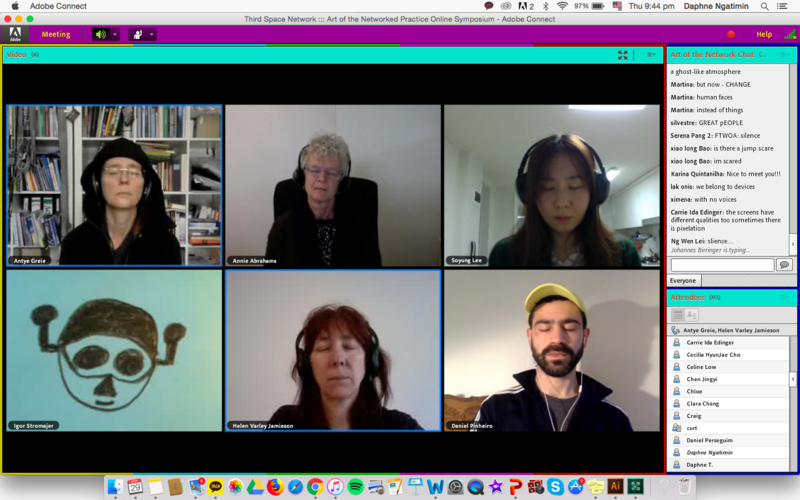 She talked about how internationalism has grown over the past years into a global democratic culture to demonstrate how artist from different location can meet and perform together via the internet, creating digital collaborative art. 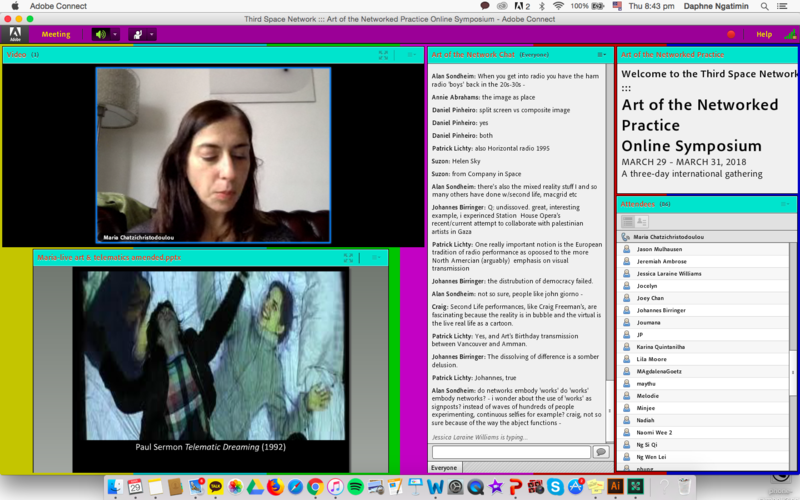 Chatzichristodoulou first referenced Galloway and Rabinowitz artworks and how they overcame the use of technology to create collaborative art in real time and virtual communication. Their first aim was to identify new genres and hybrid practises. This led to the creation of Hole in Space (1980) to exhibit bandwidth communication showing rich emotions through the third space. It showed the beauty of people coming together in another space. Another important artist that embraces telematic arts as mentioned is Paul Sermon. His art piece Telematic dreaming was a set up environment of two bed, one in different location. The bed becomes a place of encounters and the ability to access the users space anytime through the ‘sense of touch’ in the context of the bed and screen via telematic space. Furthermore, she talked about Annie Abraham and how her art pieces are filled with tentativeness and interconnectivity — embracing the messy and malleable. Abrahams embraces the liveness, miscommunication and network failure. She highlights the idea of the engagement in complexities and poignancies in everyday life as a fundamental to break down and blur the line between performer and viewer. Chatzichristodoulou ended her keynote by talking about Rabih Mroue. He pointed out how media has manipulated a particular image of reality. Mroué brings forth the idea where the use of digital technology is so manipulated that reality is somehow depicted in cinematic ways: staged and seen through lenses or screens. In The Pixelated Revolution (2012), the viewers can compare the videos of Syrian protesters with the avant-garde filmmaking movement Dogme 95 manifesto. He compares frames and footages from mobile phones of protestors in Syria and the government. It shows the contrast of a raw and shaky film to a clear and framed footage by the government. In the film, the protestor is documenting his own death, which brings the idea of someone using technology to broadcast towards the community to make judgements and writing history. This reflected how the digital world can be so manipulated that there is a blur line of what is real and what is not. In relation to social broadcasting, who knows if what is shown is curated and framed. Who is to tell what is real and what is fake? How do we know if information being fed to us now is also real? 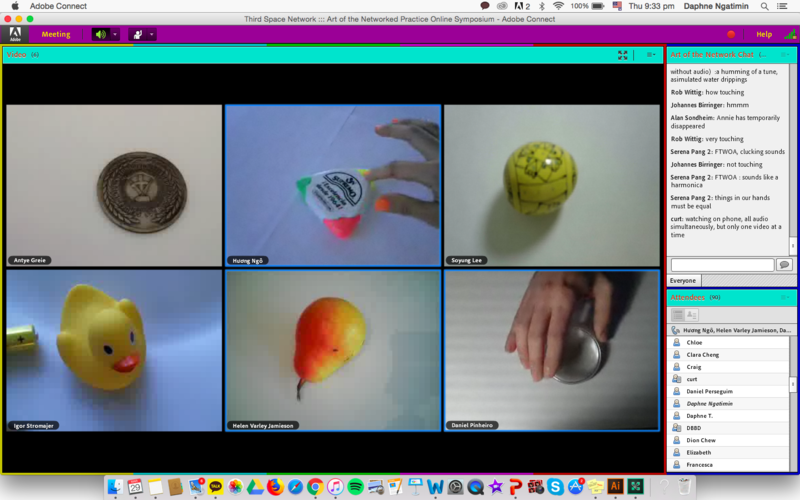 After Chatzichristodoulou’s keynote, Annie Abraham performed an online ensemble, Entanglement in training (2018), along with her collaborators Antye Greie, Helen Varley Jamieson, Soyung Lee, Hương Ngô, Daniel Pinheiro, and Igor Stromajer. This piece displayed Annie Abraham’s approach in creating a space where her co-performers can discuss ideas together to achieve a performance contributed by others and not just one where it is carefully curated. Abraham mentioned that the entanglement between machines and how people can make things happen. Day 2 (30th May) of the symposium, Matt Adams presented on Blast Theory, which is one of the most controversial works from the late 1990. It consists of a group of artists based in Brighton, UK led by Matt Adams, Ju Row Farr and Nick Tandavanitj – collaborating with the mixed reality lab at the University of Nottingham. Matt Adams talked about different art statements from Kidnap, Uncle Roy All Around You, I’d Hide You, My Neck of the Woods and many others. It all transforms real life into a burst of virtual realm, ‘contaminating’ it with its unexpected, messy and often paradoxical essence. Kidnap, portrays a fictional world of myth by story making and interconnectedness. 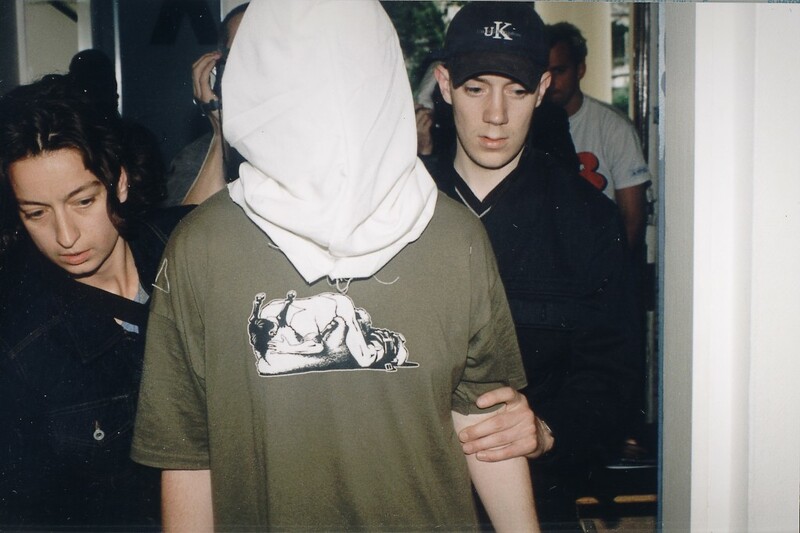 Spectators paid £10 to enter a lottery to experience the stimuli of being kidnapped. 10 people were chosen at random. It reflected a classic exposé on the participatory act of losing the power of control, simultaneously, being in control. Another example is Uncle Roy All Around You, where online and street players collaborate to find ‘Uncle Roy’ before being invited to make a commitment to a stranger. Web users help search for Uncle Roy through a digital map of the area and sends messages to the street players to help find Uncle Roy. The street players were set out to find Uncle Roy with a small tablet given under 60 min to find him. Near the end of the game, players were asked if they would help a stranger in crisis and help comfort them? This connects the street players and online players together to the people who answered yes. However, questions were raised as to what extent should they treat it seriously or if it was just for the game. The whole point of Blast Theory was to find the idea of connecting people across the internet, shortening the distance which can create a type of revolution. However there is a danger through the idea of utopian where everything is possible can become nothing is possible as discussed. To conclude, the techniques and technologies of social broadcasting today are universal and constantly developing. By looking back at the history of media artists and activists, we have unfolded and exposed the use of network and social media into a collaborative platform for creative invention and social broadcasting. Social broadcasting has revolutionised the way society communicates, where the control of media and narrative has shaped our lives in taking the control of manipulating our identity to an identity that we now embrace through the norm. We have evolved from a centralised individual streaming to a collaborative telematic performance through global peer-to-peer interaction from both artists and audience. We have created something new and unexpected whilst embracing the mess. What intrigued me the most out of this whole experience was the interactivity and volume the participants hold in the chatroom. The discussion that took place can go so much in depth yet wide in terms of topics being discussed. This shows the true meaning of being interconnected in the third space with strangers by sharing our own thoughts and perspective; stretching the idea far beyond the expected that could go on and on. An unfinished communication revolution. Daphne, an excellent essay! Beautifully written and extremely well documented. You presented many excellent details, observations, and critique throughout. I was particularly struck by the connection you made between the chat, where many who were strangers to one another were engaged in a very dynamic and compelling conversation; to your reference of Uncle Roy All Around You by Blast Theory, in which they ask: “would you trust a stranger?” I believe what you are saying here is that network, which allows us to be less inhibited, more revealing about ourselves, and therefore more engaged with complete strangers. I too found the chat very exciting, the kind of “alternate social world” that Gene Youngblood discusses. It is interesting how the decentralization of the space we inhabit, its distributed nature, despite geographical separation, creates such a nurturing, trusting environment. Of course not always: but I believe that with encouragement this is possible. Yet, we agree that the communications revolution is still unfinished. Previous Previous post: Everyone’s got a Dark Side. Jonathan Goh on Bauhaus? Bauhaus. ROS FARZANA on Bauhaus? Bauhaus. Nicholas Boay Kai Xun on What The Singlish ?? !1?